Now that Summer is over we have spent a lot of time hanging out close to home. My boys spend a lot of time building, role playing and watching movies. And while they have always loved trains, it wasn’t until this past Summer that they became interested in Thomas The Train. The show came on one lazy afternoon and they were first drawn in by the theme song, but loved the adventures that Thomas and his friends would end up on. At the end of the Summer we visited Maryland and rode on a Steamtrain from 1916 so we had done a bit of pre-vacation education on trains and their systems, which also helped peak their interest in this loveable icon. Coincidentally Thomas is also a steam train and designed after the LB&SCR E2 class, which was built between 1913 and 1916! 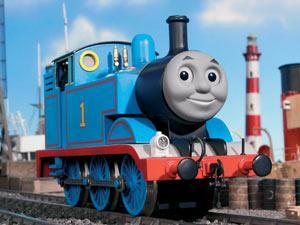 But despite being an almost 100 year old choo choo, Thomas still embarks on a lot of adventures with his friends. In his most recent movie, King of the Railway, Thomas & his Friends meet new friends and discover suits of armour; coats of arms and legends of long-ago heroes. Their bravery is put to the test when their new friend Stephen goes missing. Will Thomas find him in time? Will the engines discover the truth about the Island of Sodor’s biggest mystery? 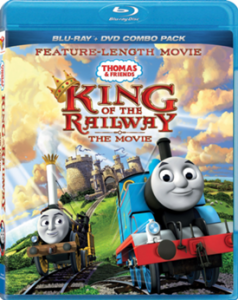 It’s a crusade of knightly proportions for Thomas & Friends in this epic movie! To re-create the movie at home kids can get the Thomas & FriendsTM Take-n-PlayTM Thomas’ Adventure Castle Playset, an on-the-go portable playsets for on the go play. OR the Thomas & FriendsTM TrackmasterTM Castle Quest Set which we took this video of when were at Toy Fair earlier this year.